This article is about the ritualistic and political suicide method. For the record company, see Self Immolation. The English word immolation originally meant (1534) "killing a sacrificial victim; sacrifice" and came to figuratively mean (1690) "destruction, especially by fire." Its etymology was from Latin immolare "to sprinkle with sacrificial meal (mola salsa); to sacrifice" in ancient Roman religion. Self-immolation "setting oneself on fire, especially as a form of protest" was first recorded in Lady Morgan's France (1817). It was Western media coverage of Buddhist monk Thích Quảng Đức's suicide by fire in protest of the Buddhist crisis caused by the Vietnamese Ngô Đình Diệm regime in 1963 that introduced the word "self-immolation" to a wide English-speaking audience and gave it a strong association with fire. The alternative name bonzo comes from the same era, because the Buddhist monks who immolated themselves were often referred to by the term bonze in English literature before the mid-20th century, particularly when describing monks from East Asia and French Indochina. This term is derived from the Japanese word bonzō (凡僧) for a priest or monk, and has become less common in modern literature. Self-immolation is tolerated by some elements of Mahayana Buddhism and Hinduism, and it has been practiced for many centuries, especially in India, for various reasons, including jauhar, sati, political protest, devotion, and renouncement. 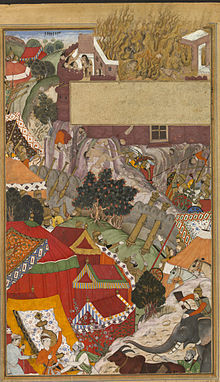 Certain warrior cultures, such as those of the Charans and Rajputs, also practiced self-immolation. The act of sacrificing one's own body, though not by fire, is a component of two well-known stories found in the ancient Buddhist text known as the Jataka Tales, which, according to Buddhist tradition, gives accounts of past incarnations of the Buddha. In the "Hungry Tigress" Jataka, Prince Sattva looked down from a cliff and saw a starving tigress that was going to eat her newborn cubs, and compassionately sacrificed his body in order to feed the tigers and spare their lives. In the "Sibi Jataka", King Śibi, or Shibi, was renowned for selflessness, and the gods Śakra and Vishvakarman tested him by transforming into a hawk and a dove. The dove fell on the king's lap while trying to escape the hawk, and sought refuge. Rather than surrender the dove, Śibi offered his own flesh equivalent in weight to the dove, and the hawk agreed. They had rigged the balance scale, and King Śibi continued cutting off his flesh until half his body was gone, when the gods revealed themselves, restored his body, and blessed him. The Bodhisattva "Medicine King" (Bhaishajyaraja) chapter of the Lotus Sutra was associated with auto-cremation. In a previous life, 'Medicine King' Bodhisattva burnt his body as a supreme offering to the Buddha. The Lotus Sutra describes the Bodhisattva Sarvarupasamdarsana drinking scented oils, wrapping his body in an oil-soaked cloth, and burning himself. His body flamed for 1,200 years, he was reincarnated, burned off his forearms for 72,000 years, which enabled many to achieve enlightenment, and his arms were miraculously restored. Zarmanochegas was a monk of the Sramana tradition (possibly, but not necessarily a Buddhist) who, according to ancient historians such as Strabo and Dio Cassius, met Nicholas of Damascus in Antioch around 13 ACE and burnt himself to death in Athens shortly thereafter. Self-immolation has a long history in Chinese Buddhism. The relevant terms are: wangshen Chinese: 亡身 "lose the body" or Chinese: 忘身 "forget the body", yishen Chinese: 遺身 "abandon the body", and sheshen Chinese: 捨身 "give up the body". James A. Benn explains the semantic range of Chinese Buddhist self-immolation. But "abandoning the body" also covers a broad range of more extreme acts (not all of which necessarily result in death): feeding one's body to insects; slicing off one's flesh; burning one's fingers or arms; burning incense on the skin; starving, slicing, or drowning oneself; leaping from cliffs or trees; feeding one's body to wild animals; self-mummification (preparing for death so that the resulting corpse is impervious to decay); and of course, auto-cremation. The monk Fayu 法羽 (d. 396) carried out the earliest recorded Chinese self-immolation. He first informed the "illegitimate" prince Yao Xu 姚緒—brother of Yao Chang who founded the non-Chinese Qiang state Later Qin (384-417)—that he intended to burn himself alive. Yao tried to dissuade Fayu, but he publicly swallowed incense chips, wrapped his body in oiled cloth, and chanted while setting fire to himself. The religious and lay witnesses were described as being "full of grief and admiration." Following Fayu's example, many Buddhist monks and nuns have used self-immolation for political purposes. Based upon analysis of Chinese historical records from the 4th to the 20th centuries, Benn discovered, "Although some monks did offer their bodies in periods of relative prosperity and peace, we have seen a marked coincidence between acts of self-immolation and times of crisis, especially when secular powers were hostile towards Buddhism." For example, Daoxuan's (c. 667) Xu Gaoseng Zhuan(續高僧傳, or Continued Biographies of Eminent Monks) records five monastics who self-immolated on the Zhongnan Mountains in response to the 574–577 persecution of Buddhism by Emperor Wu of Northern Zhou (known as the "Second Disaster of Wu"). James A. Benn concludes that, "for many monks and laypeople in Chinese history, self-immolation was a form of Buddhist practice that modeled and expressed a particular bodily or somatic path that led towards Buddhahood." Jan Yun-Hua explains the medieval Chinese Buddhist precedents for self-immolation. Relying exclusively on authoritative Chinese Buddhist texts and, through the use of these texts, interpreting such acts exclusively in terms of doctrines and beliefs (e.g., self-immolation, much like an extreme renunciant might abstain from food until dying, could be an example of disdain for the body in favor of the life of the mind and wisdom) rather than in terms of their socio-political and historical context, the article allows its readers to interpret these deaths as acts that refer only to a distinct set of beliefs that happen to be foreign to the non-Buddhist. Jimmy Yu has shown that self-immolation cannot be interpreted based on Buddhist doctrine and beliefs alone but the practice must be understood in the larger context of the Chinese religious landscape. He examines many primary sources from the 16th and 17th century and demonstrates that bodily practices of self-harm, including self-immolation, was ritually performed not only by Buddhists but also by Daoists and literati officials who either exposed their naked body to the sun in a prolonged period of time as a form of self-sacrifice or burned themselves as a method of procuring rain. In other words, self-immolation was a sanctioned part of Chinese culture that was public, scripted, and intelligible both to the person doing the act and to those who viewed and interpreted it, regardless of their various religion affiliations. During the Great Schism of the Russian Church, entire villages of Old Believers burned themselves to death in an act known as "fire baptism" (self-burners: soshigateli). Scattered instances of self-immolation have also been recorded by the Jesuit priests of France in the early 17th century. However, their practice of this was not intended to be fatal: they would burn certain parts of their bodies (limbs such as the forearm or the thigh) to symbolise the pain Jesus endured while upon the cross. A 1973 study by a prison doctor suggested that people who choose self-immolation as a form of suicide are more likely to be in a "disturbed state of consciousness", such as epilepsy. Rather than give up their way of life, a number of Buddhist monks (including the most famous case of Thích Quảng Đức) immolated themselves by fire in protest of the persecution of Buddhists under the administration of Roman Catholic President Ngô Đình Diệm in South Vietnam. An important source of inspiration for the monks and nuns who self-immolated is the twenty-third chapter of the Lotus Sutra which recounts the life story of Bodhisattva Medicine King. In this section of the Sutra, Medicine King demonstrates his insight into Śūnyatā and the selfless nature of all things by ritualistically setting his own body aflame, which burned for 1,200 years to demonstrate the immeasurable power of the Buddhadharma. Thich Nhat Hanh adds: "The bodhisattva shone his light about him so that everyone could see as he could see, giving them the opportunity to see the deathless nature of the ultimate." The widespread coverage of the self-immolations of the Buddhist monks in mid-20th-century Western media established the practice as a type of a political protest in the Western mind. Self-immolations are often public and political events that catch the attention of the news media through their dramatic means. They are seen as a type of altruistic suicide for a collective cause, and are not intended to inflict physical harm on others or cause material damage. They attract attention to a cause and those who undergo the act are glorified in martyrdom. While the burning of vital tissue can be very painful during self-immolation, one criminologist surmises that shock or asphyxiation quickly make the event painless, as do the onset of third-degree burns which destroy the nerve endings. However, fire immolation does not guarantee death for the burned. The example set by self-immolators in the mid 20th century did spark numerous similar acts between 1963 and 1971, most of which occurred in Asia and the United States in conjunction with protests opposing the Vietnam War. Researchers counted almost 100 self-immolations covered by The New York Times and The Times. In 1968 the practice spread to the Soviet bloc with the self-immolation of Polish accountant Armia Krajowa and veteran Ryszard Siwiec, as well as those of two Czech students, Jan Palach and Jan Zajíc, and of toolmaker Evžen Plocek, in protest against the Warsaw Pact invasion of Czechoslovakia. As a protest against Soviet rule in Lithuania, 19-year-old Romas Kalanta set himself on fire in Kaunas. In 1978 Ukrainian dissident and former political prisoner Oleksa Hirnyk burnt himself near the tomb of the Ukrainian poet Taras Shevchenko protesting against the russification of Ukraine under Soviet rule. The practice continues, notably in India: as many as 1,451 and 1,584 self-immolations were reported there in 2000 and 2001, respectively. A particularly high wave of self-immolation in India was recorded in 1990 protesting the Reservation in India. Tamil Nadu has the highest number of self-immolations in India to date. Since 2009, there have been, as of June 2017, 148 confirmed and two disputed self-immolations by Tibetans, with most of these protests (some 80%) ending in death. The Dalai Lama has said he does not encourage the protests, but he has spoken with respect and compassion for those who engage in self-immolation. The Chinese government, however, claims that he and the exiled Tibetan government are inciting these acts. In 2013, the Dalai Lama questioned the effectiveness of self-immolation as a demonstration tactic. He has also expressed that the Tibetans are acting of their own free will and stated that he is powerless to influence them to stop carrying out immolation as a form of protest. A wave of self-immolation suicides occurred in conjunction with the Arab Spring protests in the Middle East and North Africa, with at least 14 recorded incidents. These suicides assisted in inciting the Arab Spring, including the 2010–2011 Tunisian revolution, the main catalyst of which was the self-immolation of Mohamed Bouazizi, the 2011 Algerian protests (including many self-immolations in Algeria), and the 2011 Egyptian revolution. There have also been suicide protests in Saudi Arabia, Mauritania, and Syria. ^ a b c Biggs, Michael (2005). "Dying Without Killing: Self-Immolations, 1963–2002" (PDF). In Diego Gambetta. Making Sense of Suicide Missions. Oxford University Press. ISBN 978-0-19-929797-9. ^ The Oxford English Dictionary, 2009, 2nd ed., v. 4.0, Oxford University Press. ^ "In Terrifying Color: Vietnamese Buddhist Monk's 1963 Self-Immolation". thoughtcatalog.com. 10 January 2011. ^ Sanburn, Josh (20 January 2011). "A Brief History of Self-Immolation". world.time.com. ^ "Dictionary.com: bonze". Dictionary.reference.com. Retrieved 2014-04-20. ^ Strabo, xv, 1, on the immolation of the Sramana in Athens (Paragraph 73). ^ Benn, James A. (2007), Burning for the Buddha: self-immolation in Chinese Buddhism, University of Hawaii Press, 9–10. ^ a b (2007), 199. ^ a b thichnhattu. 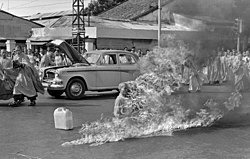 "The Self-Immolation of Thich Quang Duc". Buddhismtoday.com. Retrieved 15 March 2012. ^ Yu, Jimmy (2012), Sanctity and Self-Inflicted Violence in Chinese Religions, 1500–1700, Oxford University Press, 115–130. ^ Coleman, Loren (2004). The Copycat Effect: How the Media and Popular Culture Trigger the Mayhem in Tomorrow's Headlines. New York: Paraview Pocket-Simon and Schuster. p. 46. ISBN 0-7434-8223-9. ^ a b Prins, Herschel (2010). Offenders, Deviants or Patients? : Explorations in Clinical Criminology. Taylor & Francis. p. 291. Topp ... suggested that such individuals ... have some capacity for splitting off feelings from consciousness.... One imagines that shock and asphyxiation would probably occur within a very short space of time so that the severe pain ... would not have to be endured for too long. ^ Nhá̂t Hạnh. (2003). Opening the heart of the cosmos: Insights on the Lotus Sutra. Berkeley, CA: Parallax Press. p. 144. ^ Maris, Ronald W.; Alan Lee Berman; Morton M. Silverman; Bruce Michael Bongar (2000). Comprehensive textbook of suicidology. Guilford Press. p. 306. ISBN 978-1-57230-541-0. ^ Coleman, Loren (2004). The Copycat Effect: How the Media and Popular Culture Trigger the Mayhem in Tomorrow's Headlines. New York: Paraview Pocket-Simon and Schuster. p. 66. ISBN 0-7434-8223-9. ^ Free Tibet. "Tibetan Monk Dies After Self-Immolating In Eastern Tibet". Retrieved 20 May 2017. ^ "Tibetan dies after self-immolation, reports say". Fox News. 21 July 2013. ^ 13 Mar 2012 (13 March 2012). "Teenage monk sets himself on fire on 53rd anniversary of failed Tibetan uprising". London: Telegraph. Retrieved 29 March 2012. ^ "Dalai Lama doubts effect of Tibetan self-immolations". The Daily Telegraph. London. 13 June 2013. ^ "Self-immolation spreads across Mideast inspiring protest". ^ "Second Algerian dies from self-immolation: official". Patler, Nicholas. Norman's Triumph: the Transcendent Language of Self-Immolation Quaker History, Fall 2015,18-39. Wikimedia Commons has media related to Self-immolation.